With only a couple hours left in 2010 we couldn't resist signing up for 1 more reading challenge. Historically, we've never tracked the number of novels completed in a calendar year and so the 100+ Reading Challenge seemed like the perfect motivation to start. 1. Simply put, the goal is to read 100 novels within a calander year. Anyone can join and you don't need a blog to participate. 2. 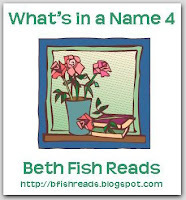 Audio, Re-reads, eBooks, YA, Maga, Graphic Novels, Library Books, Novellas, Young Reader, Nonfiction - as long as the book has an ISBN or equivalent or can be purchased as such, the book counts. 3. Crossovers from other reading challenges count. 4. Challenge begins January 1st thru December 31st 2011. 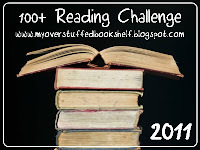 Head on over to My Overstuffed Bookshelf to sign up and view the complete details. For us, this novel got off to a rough start and any later redeeming qualities remained elusive. As a rule, we try to know as little as possible before cracking a new spine, however in the case of The Sound and the Fury, we understood even less after part 1. We’ve never pretended to be the sharpest tools in the shed, but the prose was almost impossible to understand and only later did we learn the intent behind the disjointed narrative. Sadly, even after a couple different narrators, the remaining sections weren’t much clearer. We spent most of the novel recovering from our initial disorientation and trying to fit all the characters together with their storylines. The novel did have a lone redeeming quality for us, which was the dialogue. We felt the mood of the region and the nature of the Compson family was captured wonderfully. 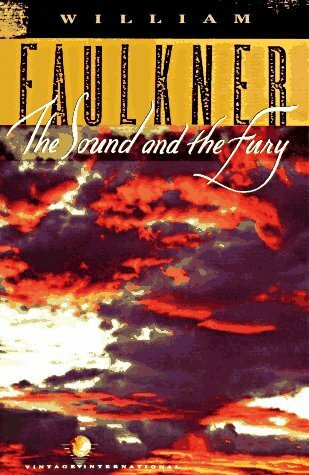 We’re definitely going to give Mr. Faulkner another try, but next time it will be with a touch less anticipation and hoopla. It’s easy to share Scrooge’s excitement and sense of urgency as we read about his many acts of kindness throughout Stave 5. The act of sending the turkey to the Cratchit home incognito and the act of overwhelming the two charity workers were both done with a wonderful childlike enthusiasm. Most of all we loved Scrooge’s wishful scheme to catch Bob late to work just so his new nature could be all the more appreciated. Bravo Scrooge! And bravo to all those who keep Christmas well! What a great book and what a fun read along! Thanks again to Dog-Eared & Bookmarked for hosting this event! Editor’s Note: Added to this year’s required reading was the viewing of the 1999 television adaptation of A Christmas Carol starring Patrick Stewart. We highly recommend this version and are always impressed with its loyalty to the book and the phenomenal performance by Stewart. It’s officially week four of A Christmas Carol read-along hosted by by Dog-Eared & Bookmarked and it’s with trembling knees that we dissect the events in Stave 4. The ghost of Christmas yet to come could very possibly be the scariest creature (with good intentions) in all of literature. Frankly, we’re shaking in our books. Fortunately, Scrooge is up to the challenge and actually encourages the final ghost to, “lead on”. We must do the same. For us, it was kind of enjoyable to see Scrooge all petrified and disheveled. For the entirety of this stave, we watch as the ghost of Christmas yet to come, thrusts his will upon Scrooge, or at least his imposing outstretched hand. Once again the imagery is wonderful as the pair visits several conversations surrounding the death of a thoroughly disliked individual (any guesses who?). We also pay another visit to the Cratchit residence, although the mood is heart-wrenchingly somber. Throughout, we see Scrooge quite anxious to know if the future events being displayed are already written in stone. At the climatic end, Scrooge grabs hold of the spirit’s hand only to find an empty garment and then a bedpost. Has Scrooge been given a second chance to write his legacy? Stay tuned this weekend as we reveal Stave 5 (literature’s worst kept secret) and the remainder of the exciting conclusion. Why: How can you not like a story where one of the secondary characters is a real life Bibliomaniac? In addition, Elinor Loredan has one of the coolest home libraries in the history of fantasy literature. Inheart explores possibly the coolest superpowers anyone could ever have the joy of possessing - reading characters into real life. Imagine for a second that you enjoyed a reading voice so powerful that whenever you read aloud, fictional characters would occasionally jump from the pages. Pretty cool, huh? Regrettably, like most wicked awesome talents, this one has plenty of drawbacks. Not to mention that real life people can accidently be swept into books, the fictional characters who come to life aren’t necessarily fond of their new surroundings. Oops. Cornelia Funke has written several great Young Adult fantasy novels, though in our mind, Inkheart is her best. With characters like Dustfinger, Capricorn, and The Shadow; plenty of intrigue awaits. And with any luck you’ll find yourself completely hooked and anxious to read the other two books in the series. Until we here at Two Bibliomaniacs are able to complete our invasive read-a-loud study, it’s probably safest to keep quite while reading this one. Editor’s Note: Don’t bother renting this movie. Your time would be much better spend pulling out your fingernails or eating a bucket of rusty nails. Editor’s Note: Not surprisingly, the Two Bibliomaniacs are split on this one. Due to this unfortunate fact, we’re inclined to offer the following disclaimer: Fantasy haters be wary. Have a wonderful weekend and be sure to stop by again real soon. Also, indulge the urge to click that button on the left side of your screen that includes the word “Follow”. It might just be the most exhilarating thing you do today… then again it might not, but how will you know unless you try. Welcome back, welcome back! Week three and we’re delighted to see only a few empty chairs this week. We’ll remind everyone that passing notes in class is not allowed and unless you want to share your message with the entire class, wait until after the final bell. Now, please get out your books and turn to Stave Three. At some point, Stave 3 marks the halfway point of our journey through A Christmas Carol read-along hosted by Dog-Eared & Bookmarked. What better way to mark this arbitrary milestone than with a giant, a smorgasbord of food, and more healthy self reflection. Without hesitation, and at Scrooge’s insistence, the Ghost of Christmas Present sets forth to teach his lesson. 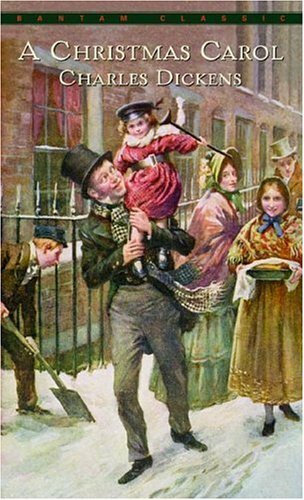 The mood throughout this Stave is somber and with the introduction of Bob Cratchit’s family the reader is able to experience a personal aside to Scrooge’s miserliness. Enter one of the most caring, selfless, and inspirational characters in all of literature: Tiny Tim. The scene at the Cratchit’s house is so powerful that it almost overshadows the second scene Scrooge witnesses at his own nephew’s house. While the message is different, the pill is just as difficult to swallow. It was quite impressive to us how Dicken’s describes the atmosphere on the street as Scrooge and the ghost make their way towards the Cratchit residences. We continue to see the transformation happening in Scrooge, especially as his heart breaks for Tiny Tim. The ghost is relentless in his efforts and even re-quotes Scrooge at one of his most despicable moments in order to prove his point. And then at Fred’s house we see Scrooge desire companionship and game, which in many ways is his most profound change as of yet. We are left at the end of Stave three with the approach of a hooded figure. The suspense has built to a crescendo and it will take every ounce of our will power to wait another week until we all meet again. Patience is a virtue we must employ… or so we’re told. Class dismissed. 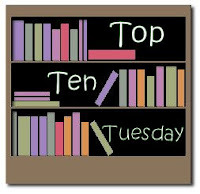 Top 10 Tuesday: the greatest thing to hit Tuesday’s since… Sorry we got nothing. Why not just head on over to The Broke and the Bookish and join the fun. For the few people that actually had the stomach to endure that laborious explanation, we give you our most anticipated reads for next year. The Girl with the Dragon Tattoo – To be honest we’re excited to finish this entire flipp’in series. We feel marked as the only two people with a blog who have not read this book. All that changes now (or at least at the start of next year)! The Discworld Series – Unfortunately, The Color of Magic left us wanting. We understand that many Fantasy book bloggers are now glaring at their computer screen and gnashing their teeth, but we weren’t impressed. Next year we plan to give this series another shot and have already committed to reading Mort and Wyrd Sisters. Hunger Games – Similar to the explanation provided in choice number 1, this novel has our YA dystopian senses salivating all over the house. Jamaica Inn – We absolutely loved Rebecca, and are excited to give Ms. DuMauier a second go. A Passage to India – We recently posted about our spirited feelings towards A Room with a View and are quite excited to see if Mr. Forrester can deliver again. The Angel’s Game – We (Evan) absolutely loved The Shadow of the Wind, but for whatever lame reason, we have not read the sequel. A Thousand Splendid Sun – We bawled our eyes out during the reading of The Kite Runner and if rumors are correct, we expect nothing less from Mr. Hosseni’s second novel. Bring on the Häagen-Dazs. About 45-55 gems we’ve yet to discover – Considering our goal is to read close to 100 novels next year we believe it’s reasonable to expect 45%-55% of our selections to be literary gold. We look forward to the new discoveries! Also, don't forget to click that follow button before you leave! We'll be sure to return the favor. Hope everyone has a great week! "Books are not meant to be believed, but to be subjected to inquiry. When we consider a book, we mustn't ask ourselves what it says but what it means..."
Why: Think Sherlock homes for the early 1980’s, with more of an epic feel… and with monks. 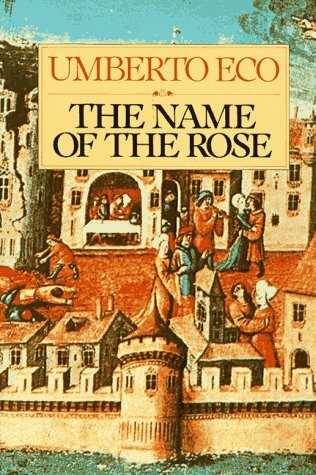 The Name of the Rose is a historical murder mystery that starts off like a faint whisper and finishes like one of those oversized bullets in Mario Galaxy. The novel is a highly intelligent read, which admittedly, caused a significant hurdle for us to overcome. The novel is narrated by Adso of Melk who basically hero worships his teacher and main problem solving enthusiast, William of Baskerville (think MacGyver in a set of oversized robe). The pair travels to a monastery in Northern Italy, which just so happens to be riddled with a series of murders – almost never a good thing. William and Adso are going to need all the logic and deductive reasoning they can muster. For us the book was just a tad bit slow, but contained enough suspense to keep us turning the pages. The ending is very satisfying and Eco does an amazing job tying together all the loose ends of his wildly complex plot. It’s also important to note that The Name of the Rose contains one of the most amazing libraries of all time. Containing a labyrinth of rooms and secret passages, visitors are almost certain to be lost within the endless shelves. Personally, we can think of no better location to be misplaced for about a week or so (maybe longer if we could find a stash of un-stale food somewhere). It seems like we begin each week reiterating the fact that we’re new to the world of book blogging (when does this excuse run out? At what point do you become a seasoned pro? ), and thus have difficulties compiling a response. We’re pleading the same defense this week! We’ve yet to participate in any giveaways, so for the time being we haven’t experienced the breathtaking excitement associated with literature freebees. That being said, probably our favorite topic to date has been reviews and posts on random literature happenings. Our very first Read-Along has also been an enjoyable experience as we are currently participating in A Christmas Carol. It's been a lot of fun diving a little deeper into a book and reading the thoughts of the other participants. We’re definitely looking forward to more of these in the year to come! Sorry for the long winded response… Happy hopping and have a great weekend! Oh, and if we haven’t mentioned it before, we’re very fond of followers on this blog – give us a try and we’ll be sure to return the favor! Why: Because at one time or another everyone’s secretly thought about trading all the Christmas consumerism for a nice relaxing Caribbean Cruise (with a stack of books of course). And even if you haven’t, it still makes for an interesting premise for a book. Skipping Christmas is about a bold couple who sets out to do just that. Their plan is to use all the money saved on decorations, food, gifts, and parties to fund an elaborate 10 day cruise. While the Kranks find their noble idea practical in the conception stage, things quickly unravel when their friends and neighbors get wind of the diabolical scheme. Throughout their journey they are confronted by an angry Boy Scout troop, Fruitcake salesmen, and neighbors picketing for the liberation of outdoor Christmas decorations. 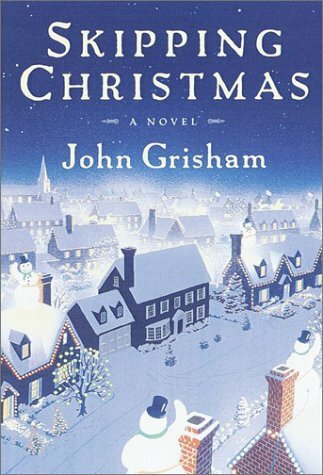 All in all, we found Skipping Christmas to be a lighthearted and fun holiday read. You’ll quickly find yourself taking sides on whether or not the Kranks should go through with their boycott. Everything is taken to the extreme and blown way out of proportion (maybe some symbolism here…), yet in the end the spirit of the holidays is not entirely forgotten. Our advice, wait for the next cold blustery December evening, pull a traditional sleeveless blanket around your shoulders, get frustrated, quickly steal your spouse’s Snuggie (the same one you gave her a hard time about last year), and enjoy this entertaining Christmas delight. That reminds us…. We should probably go plug in the light display attached to the front of our house. Time to go spread some Christmas commercialism cheer!!! Editor’s Note: The movie (Christmas with the Kranks) isn’t too bad either. It took us a second viewing to get over our annoyance at the differences from the book, but Tim Allen is always a good laugh. Plus, the performance from Jamie Lee Curtis’s is spot on. Well, we’re back for week 2 of A Christmas Carol read-along hosted by Dog-Eared & Bookmarked. Hopefully our first session was enjoyable. If everyone will please open their books to the beginning of stave 2 we’ll go ahead and get started. Quiet down in the back and Stanley; spit your gum out please…. Stave Two is almost entirely about the eventful visit from the Ghost of Christmas Past. We can only imagine what it must have felt like to hear the clock bells toll ever closer to 1 o’clock. On second thought, we don’t want to imagine it. Once again the humor in this part is solid. The highlight for us is when the ghost proclaims that his visit is for the benefit of Scrooge’s welfare and Scrooge immediately reflects that an uninterrupted night of sleep would be more welcomed. In the end, the unlikely pair decides to indulge in an evening stroll down memory lane. Five scenes are revealed which enable the reader to glean important information about Scrooge’s past (there is considerable weeping performed by the main character). We also learn that given slightly different circumstances Mr. and Mrs. Fezziwig would have been the favorites on next season’s, So You Think You Can Dance. Most profoundly however, we begin to see small glimpses of remorse within Scrooge. Overall, Stave 2 was another Dicken’s delight. As an added benefit, we experienced about an inch of winter during the reading. There’s nothing like some blustering snow to further establish the mood. Unfortunately, we’re forced to cut this post just a little short because the shovel is calling our name from the garage. Class dismissed! Extra credit if you lend a hand with the driveway! Yeaaa! It’s our new favorite day of the week – Top 10 Tuesday! Head on over to The Broke and the Bookish to join the fun. Sitting in a comfortable folding chair at the beach – We’re from Indiana so anytime we can combine ocean, sand, and reading – we’re totally there. Lying on a towel at the beach – As you can see a trend is starting to form. The beach provides very favorable reading conditions for us, especially this time of year. Bathtub – We’ve read many books in this environment and only one paperback suffered a horrible watery death. In bed – Reading under the covers with a flashlight as a child kicked off our torrid love affair with this local. Living Room Couch – This is probably our most utilized reading spot and maybe our most comfortable. Toilet – Yes, this made the list and we’re not ashamed to admit it (at least one of us isn’t). Sitting in a folding chair on the back patio – The view is hardly inspirational, but fresh air and books go hand in hand. Have a great week of the list and be sure to leave a comment so we can check out your list. Oh, and if we haven’t mentioned it before, we’re very fond of followers on this blog – give us a try and we’ll be sure to return the favor! What’s in a Name Challenge. Thanks to Bethfor hosting.Our choices are populated below, however we’re still looking for inspiration on the 2nd category. Any suggestions would be very much appreciated! Be sure to check back for exciting updates as we track our progress! 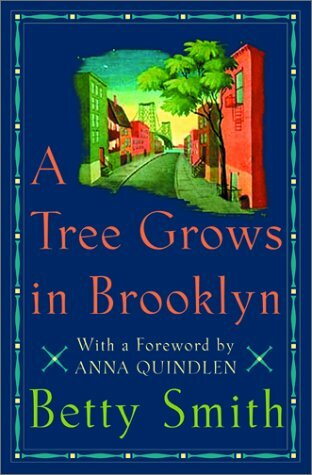 While you may not pull an all nighter to finish this one, A Tree Grows in Brooklyn is a must read. The plot is delightfully complex, though, primarily surrounds the childhood of a lonely girl who loves books (now you know why we’re so fond of her). Her family is stricken with many hardships including poverty and alcoholism, although her dad possesses one of the most underappreciated singing voices in all of literature. Symbolism is prevalent throughout and even Francie herself represents the American dream. For us it was so much fun to watch Francie bloom, ironically enough, much like a tree. We found it very easy (almost too easy…) to get caught up in each one of her successes and failures. There’s also a whole cast of great characters that evolve and mature throughout the story. In the spirit of the holiday season, we double-dog dare you not to crack a smile at some of Aunt Sissy’s antics. Editor’s Note: Like most of you, we too were skeptical of the author’s extraordinarily common name. After a thorough investigation by the heavily funded literary investigation wing of Two Bibliomaniacs, it has come to our attention that Betty Smith’s real name was Elisabeth Lillian Wehner. That’s right people – it’s time for everyone’s favorite Friday social! As always, thanks to Jennifer over at Crazy-For-Books for hosting the book party! While you take a look at this week’s question, we’ll just be over here hanging out by the beverage table…. Owing to the fact that we’re very new to blogosphere this question is quite difficult to answer. Instead, we’re going to put on the friendliest of smiles, promise not to raise your taxes, and respond with an answer slightly unrelated to the question. A Tale of Two Cities was probably the most over-hyped book we ever read. I know most readers will disagree and we might even lose a few followers, but there you have it. For all its acclaim, we just couldn’t get into this book – and we love Dickens. Great Expectations, Bleak House, David Coperfield, and Oliver Twist are some of our favorite books of all time. In fact we’re currently participating in A Christmas Carol read-along and loving it (you should definitely read our groundbreaking analysis)! Sooooo, to answer the question in our own personal way, for us, A Tale of Two Cities was the worst of times…. Oh, and before you head off looking for another dance partner, please be aware that we’re very fond of followers on this blog – give us a try and we’ll be sure to return the favor! The BBC's Big Read - How do you stack up? We’ve seen this list floating around on a couple blogs lately (most recently at Reading with Martinis) and we feel we must join in the fun. Book lists could possibly be the coolest things ever invented and the BBC’s list is our authority when looking for new reading material. Two years ago it inspired us to step outside our small cardboard reading box and expand our authors. The result was life changing (or at least a ton of really good books). We (Evan) has read 67 (in bold) of the top 100 titles and we (Erin) has read 29 (with *)…for the complete story, please refer to our A Brief Preface post. In April 2003 the BBC's Big Read began the search for the nation's best-loved novel, and the results are listed below. The people at the BBC believe that most people have only read 6 of these novels. Sooooo, what we want to know is – how do you stack up? Count ‘em up and let us know! Why: Okay, let’s get a few things out on the table. We know you’ve seen Mickey’s Christmas Carol over a hundred times. We know you can recite Tiny Tim’s memorable line in your sleep. We know you’ve mentally judged someone a Scrooge more than once in your life. Still, what you must realize is that reading A Christmas Carol is as much a part of Christmas as stale fruitcake and yellow snow. In our house, this novel has become a rich, storied tradition that started just last year... For this reason we jumped at the chance to participate in the Read-along hosted by Dog-Eared & Bookmarked. Over the next five weeks we will be diving into the world of Ebenezer Scrooge, Bob Cratchet, and Tiny Tim. The tone for this entire novel is set within the first two paragraphs. The reader is given confirmation that Scrooge’s longtime business partner, Jacob Marley, is unequivocally dead (The reader is also able to glimpse the profound humor found in all of Dicken's writing). Most importantly, we are introduced to Ebenezer Scrooge and shown the extent of his miserly existence. To further emphasize Scrooge's cruel nature, every other person we encounter stands as his polar opposite: holiday cheer charity, remorse. We are also reminded why you should never enter a dwelling once its front knocker morphs into a person’s face. What we especially love about this first stave is the imagery created. It’s so simple and yet you get goosebumps reading about Marley’s chains echoing throughout the house. You also get such a great insight into Scrooge’s character through his dialogue. We loved reading about his appeal to encounter all 3 ghosts at once in order to get things over with quicker. Finally, we love the perspective that Marley provides in the final sequence. Sorry for the overabundance of love in this review, but we… thoroughly adore this novel. Stave 1 sets the table for everything to come and definitely has us anxious to plow ahead. Until next week….